A team of Master of Finance students from the Freeman School won third-place at this year’s Texas Investor Portfolio Symposium (TIPS) Portfolio Managers Competition. Freeman’s TIPS team included, front row, left to right, Xiuhong Wu, Qi Chen, Jiaqi Bai and Scherzade Agha, and, back row, left to right, Professor of Practice Ashley Nelson, who accompanied the team, and Lingpeng Xiao. 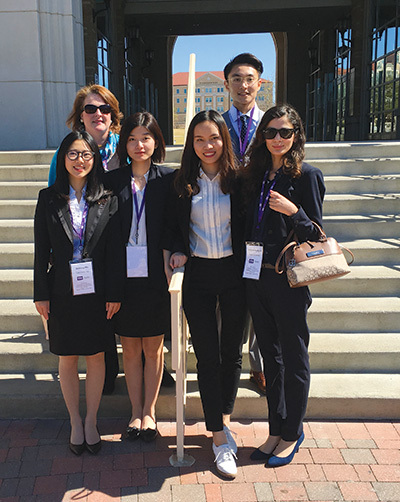 The competition, which took place at Texas Christian University in February, was part of the annual TIPS conference, a forum for students and faculty from universities in the region with investment management curriculum. As one of this year’s five finalists, the Freeman School team — Scherzade “Sherry” Agha, Jiaqi “Jackie” Bai, Qi Chen, Xiuhong “Maggie” Wu and Lingpeng “Don” Xiao — delivered a 10-minute presentation to judges that drew on their experience in the Darwin Fenner Student Managed Fund course, an invitation-only honors seminar that gives Freeman students hands-on experience managing investment portfolios. For their presentation, the students focused on the fund’s $1.3 million mid-cap portfolio, which has outperformed the S&P 400 by 12.4 percent in the last year. Sheri Tice, professor of finance and director of the Fenner Fund, said the team deserves credit for clearly presenting their strategy and how it relates to the portfolio’s above-average performance. 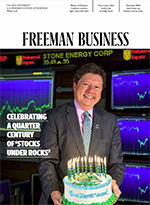 “They did a good job of explaining why the portfolio has been outperforming,” Tice said. In addition to the Freeman School, this year’s finalists also included Baylor, Rice, TCU and the University of North Texas.